Over the years Malaysian government have spent millions if not billions of Ringgit to cultivate local science and technology. In that journey, many agencies, boutique investment banks, loans, investment arms, tax exemptions, subsidies, reliefs and grants were prepared to encourage development of new local ideas as well as strengthening already existing technologies among big and small companies domestically. No doubt that along the way, there had been many rogue parties that took advantage of these privileges, but it is also undeniable that many more parties took these perks seriously in their pursuits. The grandeur of this idea at a national level is flawless. Local products ensures money does not flow out of the country when unnecessary, resulting in less imports and perhaps a better chance to export. Without trying to praise the old man too much, Tun Mahathir during his younger days as the Prime Minister understood this very well. He steered Malaysia towards venturing into many heavy industries, namely automotive, construction and even oil and gas. Not all were successful or had happy endings, but the idea of containing cash within the country was there. As a business, even if the money falls to your domestic competitor, it will mean that the money has higher chance of being spent for the well-being of the local economy, employment, and taxation. It will ensure a conducive environment to do business all around, and if the cash does not benefit your business immediately, it may do in the future as it is still floating locally. This is the distinct difference between a visionary politician, and the rest, who just loves to hear themselves sing. This is the story of how Malaysia have lost the plot along the way, perhaps with a little bit of help from those pop idol politicians. To put it in simple terms, the qualms of Malaysian technopreneurs are similar, and having spoken to many peers along the years, it can be concluded that Malaysians, ourselves are not very proud or understanding when it comes to our own products. Inferiority or lack of comprehension of how things work allow many Malaysians to be jumpy and prejudice towards our fellow men. Running a business, if compared to creating something new with not a mature market are completely different ball games. Just to give a better horizon, creating a new market, along with educating the public and enterprises is always the silent elephant in the room when you don’t have massive funding. Usually when you are small, and many of what you are developing are still not at its decency, it is harder for you to capture the imagination of many, including the investors, government and agencies. You are typically being looked down upon when you are at a start up phase, and this is understandably normal. Despite of these initial symptoms of prejudice, the early stage is always the easiest phase. When you are on the growth phase, this is when problems start occurring. Growth means the company becomes hungry, hungry for revenue. Revenue seeking means meeting a lot of people, Malaysians rather. When meeting government agencies for example, they will start comparing you to foreign technology of a similar field according to their understanding. Similar attitude is received from the suit blazing city dwellers and corporations. With these bunch of people, usually when comparisons are made, not only a far superior technology from abroad is usually compared with, they will also expect a miniscule of the foreign price tag since you are local. They have no shame in saying that they have spent millions on a foreign technology, and will tell you straight to your face that they are not even willing to spend a hundred thousand with you for the same thing. Bear in mind, most of the characters above will not survive for three days running their own business if they had to. Government bodies in particular will be new to the technology that you provide, but they are usually interested as they see a realistic solution to their domestic problem. The government bodies will be interested to learn from you, build the standards and specifications with you, but yet when comes to the crunch, you will still lose out in the tender process, weirdly enough, to companies that are not even a player in the field, but representing a foreign company that is. Undoubtedly, the cost for tender or quotation is simply much higher. At times, as the pioneer, you can prove that you are the only one that can provide the service in the country. It should be an advantage as you are local and a sole provider, but even this can be turned to a punishment. Being successful in your sphere as a Malaysian technopreneur will make the departments question on monopoly, or even suggest to not work with you since this can potentially make you big. Again, one can say a similar treatment can be reflected with big corporations in Malaysia. Once you are on a growth stage, the typical thing to happen is that the bigger boys will try to crush you as they may see a new local player to be of threat for the share of a new market. What is unusual is that rather than trying to collaborate and work with a new emerging local player, Malaysian big corporations prefer to bring in a foreign player to compete with you. Again, this is a prejudice in thinking that they can do better, or that local products is not good enough for them. Contrary, this will not only lead to unnecessary competition in a still fragile new market locally, but as mentioned earlier, it will make money flow out of the country. You can still argue that perhaps the occurrences above are nothing to do with local prejudice, but maybe elements of hidden corruption. To make matters worse for any local technopreneurs out there, is the public sentiment itself. For the following factor, corruption is definitely not in consideration. Perhaps laced with long time stigma over low quality, Malaysians tend to think that local products are not good despite of being cheaper. The bar level Malaysians put for local technologies are always against the giants of the West and Japan. This is perfectly fine, if it is judged reasonably with common sense. From the tech world perspective at least, no one seems to be bothered to understand the development required in making a good application, software, machine tool, etc. Hence Malaysians blindly expect that an application of a Series-A Malaysian start-up should be equivalent of a multi billion corporation, if not they will simply put in their complains and customer support issues inside the rating commentary box to leave a permanent scar. Whilst this is all advantageous and exciting for consumers, if misappropriated, it is used to go against the local ecosystem. Why discriminatory? 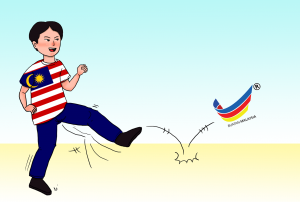 Because given the same scenario of frustration, a Malaysian is reluctant to place a smear in a commentary box of a foreign app, due to their own inferiority with the international world. This could be caused by a simple fact that they are conscious about their written English, hence the lack of confidence to display their emotion in writing on an international platform. Sometimes when we are in familiar environment, we feel that we have a better understanding of what is going on and are more vocal. When we are in unknown territories, we have inferiority complex and will not show true colours in case if what we are saying can perhaps expose our own lack of comprehension. At home soil, the public is less forgiving, even if it is their own stupidity to be the root cause, they are not ashamed to announce it. This short coming in Malaysian mentality is an unnecessary hurdle for progress. So from here, there is only two routes to the problem above in New Malaysia. Either we abandoned all efforts and investments for local science and technology, or we buckle up and embrace it. Embracing local products should not mean sacrifices or compromises. If it does, then it defeats the purpose. Embracing local technology means that the government, private sectors, and the public, should give initial support to provide a fair chance for the local product and technology to prosper, and perhaps later benefiting our society by providing lower costs for goods, employments, and a better public service due to taxation that is gained from these businesses. It is not rocket science and it has been done before, search for Kempen Beli Buatan Malaysia. It is also the emotion and self belief amongst the Malaysians that need to be restore. The other route will be just not to bother, and jump on the foreign band wagon when it arrives, if it ever arrives. We can use American, Chinese and European goods and technologies, and still maintain satisfaction and happiness. We can live a life with artificial intelligence, big data, block chain, and everything else the next industrial revolution promises, as long as it is not ours. We can continue living a life of consuming and importing, and still be happy. But remember that with all good times eventually will snow ball to very hard times, but why should we care? Leave it for the future generation to figure it out, it is not a problem for us to worry about. We should only focus at creating the problems for now.